It is crazy to think that we do in fact live in a day and age where you can get a soundbar for under 100 bucks! So now you can make sure that your fancy TV has some epic sound that goes along with the awesome action that is on screen. Or if you want, you can just use it as a wireless speaker you can connect your phone to as you blast some Spotify. I was lucky enough recently to get the chance to try out some of the best soundbars under 100 bucks. I am a real movie buff and I can tell you that I gave each of these a really good testing. Why Does My Expensive TV Need A Soundbar? This is the question many people ask themselves, but one thing that is commonly agreed on is that while TV picture quality just keeps getting better and better. The speakers tend to suffer as most manufacturers want to keep their TV’s as streamlined as possible. This is why even very expensive and modern 4K TV’s have pretty standard speakers. 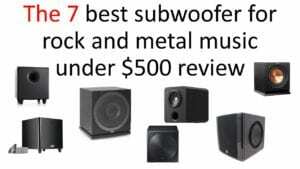 Let me say that just down below are some incredible deals and all of the soundbars we are going to look at are under 100 bucks. But you have to keep realistic expectations when you are spending under 100 or in some cases even 50 bucks on a soundbar. 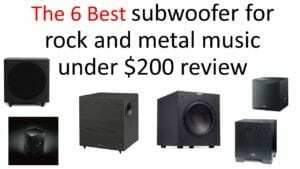 These are made for those on a tight budget who want a bit more kick in the bass than what their TV speakers are offering so when looking at soundbars from the lower end of the price spectrum always keep in mind that you are not going to get the same sound from one of these as you are a two or three hundred dollar one. Ideal if you want to spend under 100 bucks on a soundbar, but still want something that is good quality. This TV Sound Bar, Meidong Bluetooth Soundbar with Built-in Subwoofer really is quite surprising. The style of it is really smart, it has a sleek design and has a very robust feel to it. In regards to the sound quality, this is one very loud soundbar and best of all, I turned it up and there was no rattling or tiny sounds. I blasted Transformers Age Of Extinction through this and it was epic! Of course, the built in subwoofer is a nice bonus. It is not the most powerful subwoofer in the world, but you can certainly tell it is there. For under 100 bucks, this is very impressive. It connects to any Bluetooth device very quickly, but it can also be connected via cable if you have older devices. To put down the subwoofer is a little harsh as it is more of a bonus feature, but still, it is not the most powerful. The remote control while functional does require you to press it pretty darn hard to get it to register. To be fair these are very minor complaints and in general, I was very impressed with this. If you want something that is cheap, cheerful and is not behind your TV like the built in speakers are, this could be the soundbar for you. At under 50 bucks, I did not have a lot of hope for the Dansrue Multifunctional Sound Bar Speakers for TV and it is very basic. But on the flipside of this. If your TV has its internal speakers on the back, having this sitting out front is going to be a much needed improvement. No matter if you are watching movies or watching the game, you will be pleased with the sound. Just do not go in expecting movie theater quality sound and you will be fine. You do have to charge this, but off a single charge, you are getting close to 8 hours of speaker time. Look this is a very basic speaker. If you do not use the remote (which is pretty good by the way) you have to use a dial to change the volume like you would on an 80’s stereo. The bass is very low, like really, really low so that is something to keep in mind. Again this is a budget priced soundbar, but I would bet that most people would be surprised with the quality of sound coming out of this. If you want great quality, but you do not want to spend over 100 bucks, you will have a hard time topping this soundbar. The VIZIO SB2820n-E0 Soundbar Home Speaker shows that you can actually get a high quality soundbar under 100 bucks. Where to start with this? Ok, let me say that the sound on this was so good that I had to check numerous times that it really was under 80 bucks. I tried it with Avatar, Jurassic Park, and Rogue One all because I had to keep trying it as I could not get over how good the bass was, the treble and how clear it was when people would talk. 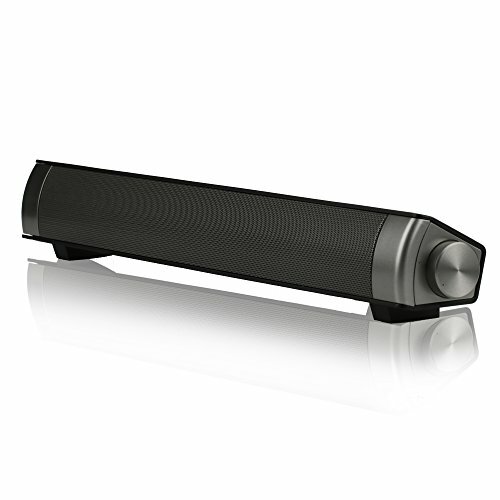 It is a very well made soundbar that looks just as cool as it sounds. For this price, beating this is going to be very hard. I know some of you may want to spend around 50 bucks, but this is well worth the extra money. There is no going back! 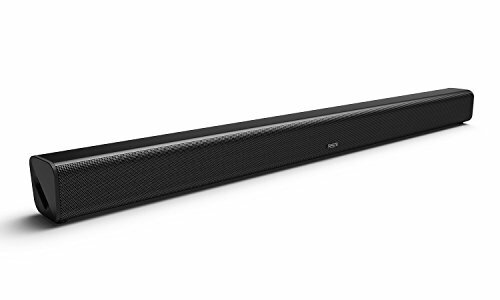 I think this is a great soundbar so good that once you experience it, you may just become a fully fledged audiophile who starts to pay attention to sound in movies. Also, the sound is so great that you will most likely want to get a subwoofer to go with it. I really cannot think of an actual problem that this has. If you are looking for a soundbar that has a built in subwoofer for your home theater, this is for you! I have tried out one of the AmazonBasics soundbars before and found them to be very good. This one here is like the other 2.1 soundbars they have. It has some very nice sound and I feel that no matter what kind of movie or game you are watching it is great. Even for music, this is very nice as my wife loved using Spotify with it, which brings me to another point. It could not be any easier to connect things to this. It is easy and very fast. The big bonus of this, of course, is the included subwoofer. It offers a very nice rumble and I think that it does make this worth the just under 100 bucks they are asking for it. I really like the sound quality of this soundbar, but it is very close to the 100 bucks price range. Also while I think the sound is great (especially with action movies like Suicide Squad) I did notice I had to have it turned up pretty loud, but since when is loud a bad thing? If you are looking for a stylish and affordable way to give your movies and video games a high quality sound, you cannot go wrong with this. The first soundbar we are looking at is actually coming in at under 100 bucks! This TaoTronics Sound Bar Wired and Wireless Bluetooth Audio has a very interesting design in that instead of being just plain black. Right down the middle is a silver bar which lets you manually change volume, turn it on and so on. It is very easy to set up wither wirelessly or via cable. The remote control it comes with is also easy to use and while most people will just want volume up and down, it does have some more settings. There are four different speakers in this soundbar so for the price you are getting a very rich and solid sound. It may not be the fanciest, but if you are looking for a cheap upgrade to your TV’s speakers, you cannot go wrong with this. While I think that silver bar really breaks up the design is cool. For some people, this may be something that makes the soundbar stand out too much. While you can connect many different devices to this. One thing to watch out for is that it can take the soundbar a couple of seconds to pick up a device so make sure you are patient. For those who are looking to improve the sound of their TV, but not at a great expense. This is the soundbar for you. The Mighty Rock Bluetooth Soundbar 30 Watt 2.0 Channel Home Theater Speaker right now is going for around 80 bucks which is an absolute steal. This one here only has two speakers, but I do not think that is actually a bad thing. While it is not giving you surround sound, you are getting some fantastic stereo sound through this and I was very impressed with the quality while watching movies and using it with my phone for Spotify. The all black design means that it will blend into your entertainment center and the buttons are all on the side which keeps them hidden. The remote control is nice and easy to use and no matter if you are using this via Bluetooth or with the included RCA cable, I do not see anyone having any issues with this at all. Let me start by saying for 80 bucks this is a definite improvement over your TV speakers. But at the same time think of it as a better version of what your TV is already offering. For music though, this is awesome even with the less than powerful bass that it provides. For a first soundbar, this ticks all the boxes and will not make your wallet cry either. For the person looking to get a soundbar for under 40 bucks this one has to be on their shortlist. 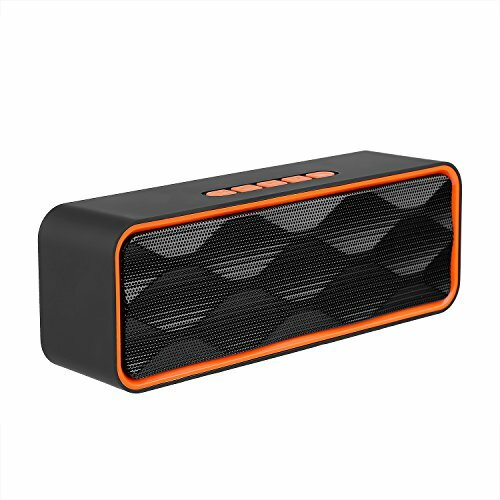 It does actually work very well as a wireless speaker for your phone when you are listening to music and it connects to your phone (or other Bluetooth devices for that matter) very easily. It may not be the best when it comes to sound or fanciest, but if something cheap and cheerful is what you are after, consider this. My main issue with this is that while you can use your TV remote. The actual soundbar requires you to get up off the couch and manually change the volume. Also, this has a lithium battery and they advise that you do not use it while it is charging! This I am sure will be super annoying for some people. But to be fair the battery does give you around five hours of use. For the person looking for a good and reliable soundbar that offers awesome stereo sound for your movies, music and video games, you need to consider this. The AmazonBasics 2.0 Channel Bluetooth Sound Bar is one that really took me by surprise. First of all, it has a very robust feel to it and I love the overall design as it has a very cool look. Which when you consider this is well under 100 bucks is pretty neat. The sound quality offered is 2.1 stereo and I was very happy with the bass and the sound in general as I put it through its paces. One thing I liked was that the soundbar has different presets for different sounds like movie and news. It was fun messing with these and finding which one I liked best. 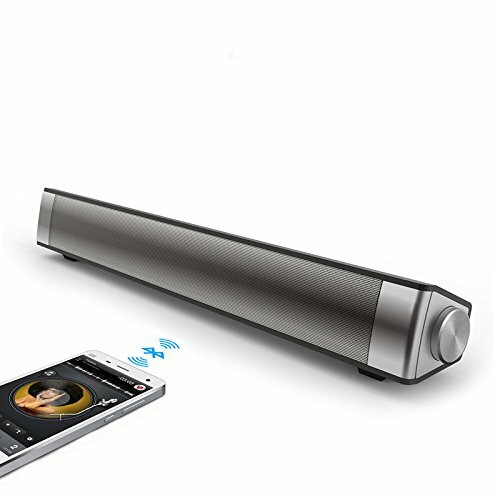 This soundbar also connects very easily to your phone so it is awesome for streaming music. It may not be the fanciest soundbar, but I was very impressed. I am not sure why, but Amazon does state that this is aimed at TV’s 42 inches and under. What their reasons for this are, I do not know. But I used it on a 55 inch TV and it was fine. Also, it is important to know that this is only offering 2.1 stereo sound. Now the sound quality is fantastic, but you are not getting that 3.1 sound like some of you may be wanting, so keep that in mind. 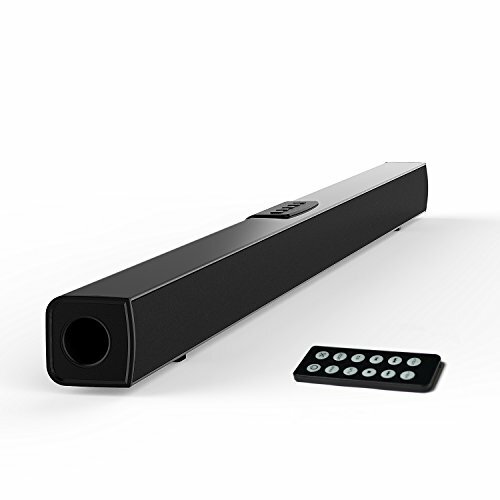 If you want something that is loud and is going to stand out in your home theater or living room, this is the soundbar for you. The MEGACRA S7020 Sound Bar Wired and Wireless Bluetooth Home Audio, Speakers are quite the impressive specimen. 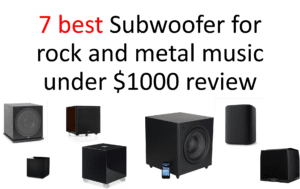 It is one of the larger subwoofers in the sub 100 bucks mode that I have seen and as a result, it has a really high quality feel and look to it. As far as the sound quality goes I was very happy with how this was blasting out Watchmen as I watched it. The bass is good and wow is this thing loud! One thing that I have to give special mention to is the 4 drivers and the DSP technology. Basically, this means that it really pushes the sound at you with real clarity. Honestly, the sound is very impressive and I do think it makes it worth that little bit of extra money it costs. I really liked this soundbar and I feel that those who are just on the edge of being an audiophile. With that being said, those looking for something cheap and cheerful may not want to spend that extra money. Also while I love the large design and I think it looks cool in a home theater, some may find it a little too big. If you want to just cheaply dip your toe into the world of soundbars this is an affordable way to do it. 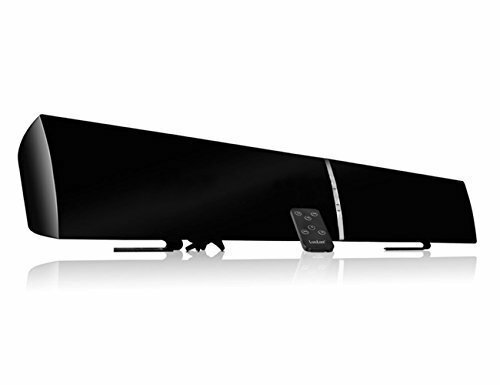 At under 20 bucks, you know right off the bat that you are not getting movie theater sound with this soundbar. But I will counter that by saying that for around 16 bucks, the sound this offers is not bad at all. You do have to charge it and off a charge, you get many hours of use. It can easily fit under your TV and provide you with an extra speaker if the ones on your TV are not getting the job done. What I feel this is aimed at is for families who want a speaker that can be taken all over the house. You can use it in the living room on the TV, the kids can use it with their iPad and mom can use it with her phone while she is pottering around in the garden. Look at 16 bucks, I feel bad talking about the negatives, but this is far from being the best soundbar I have used. I would say that as the main speaker for your TV, it is not going to cut it. But as an extra speaker for general use for the odd movie on TV or for listening to music, you cannot really complain at 16 bucks, can you? 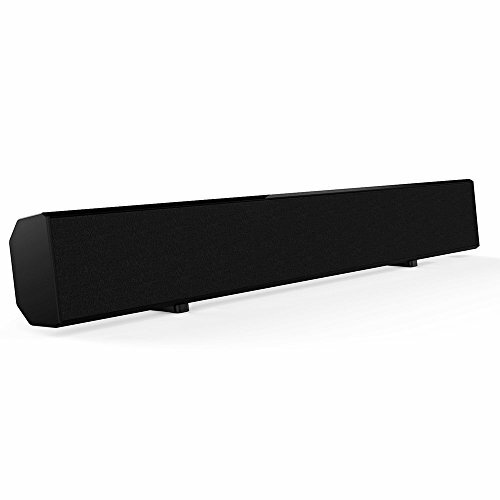 If you want high quality sound, but at a very reasonable price, this is the soundbar for you. This awesome Richsound Research Soundbar really did blow me away. At around 60 bucks and only being a 2.0 soundbar, I was not expecting a lot. But the deep bass and the clarity of speech along with the way it handles music is very impressive. I tried more than a few movies (I ended up having a bit of a Fast & Furious marathon) and was blown away each and every time. Even my technophobe wife connected her phone to this and was impressed. Along with the great sound, I really do love the design of this soundbar. It just has a real classy and smart design that makes it ideal for a home theater or a living room. The remote control I got with this was not the best. It worked fine, but like other budget priced soundbars, I found I had to press it hard. The sound this produces is great, especially the bass. But I do feel that had they thrown in a subwoofer and whacked on an extra 10 – 15 bucks it would have been even better. 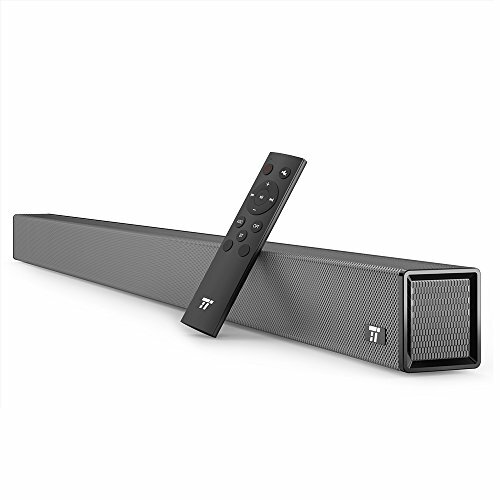 For those who have a lot of devices and love to play around with their tech, this is the soundbar that you are going to have a lot of fun with. The first thing you notice about the LuguLake TV Sound Bar 3D Surround Wireless Speaker for Home Theater is the design. Instead of just sitting flat or on rubber feet, it actually has these rather elaborate feet which I feel sets it apart from the rest. At around 75 bucks, LuguLake tried their hardest to make this as high quality as possible. I was very happy with the general sound that this provided and while I do not think the virtual 3D surround sound that it has is perfect. It does give you a bit of movie theatre magic when you are watching a movie, even if you only use it every now and again. While it can be connected wirelessly, it has a ton of inputs on the back so no matter how many devices you have or how old they are, I cannot think of anything that would not be able to be connected to this. I look at the surround sound this has as kind of a bonus. Most people will just have it as a standard soundbar, but every once and a while having a little fun with the 3D surround sound can make a movie watching experience that much better. The remote while functional does have a rather cheap feel to it, but as the actual soundbar is so high quality I can forgive this. 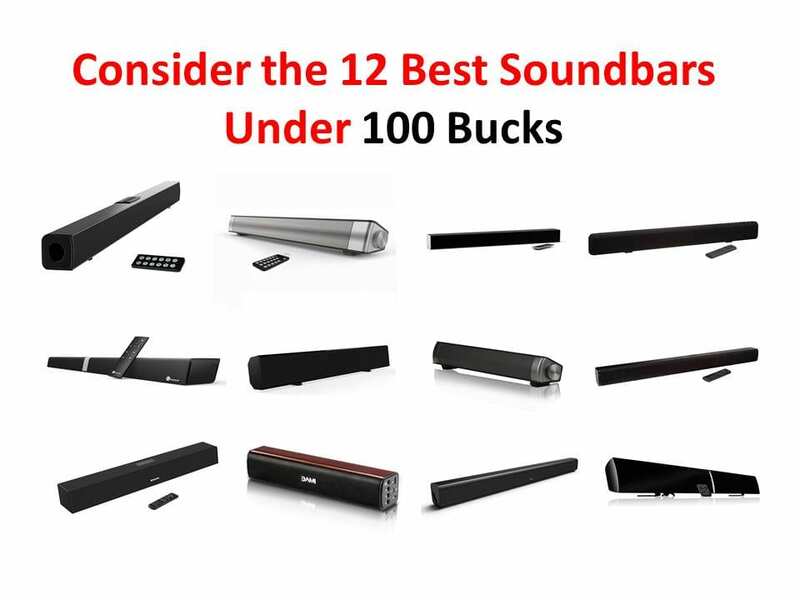 As you can see we have looked at a lot of good soundbars here that will not cost a fortune. While some of these are under or around 50 bucks. I personally feel that you are sometimes better off spending that little bit of extra money as it will serve you better in the long run. 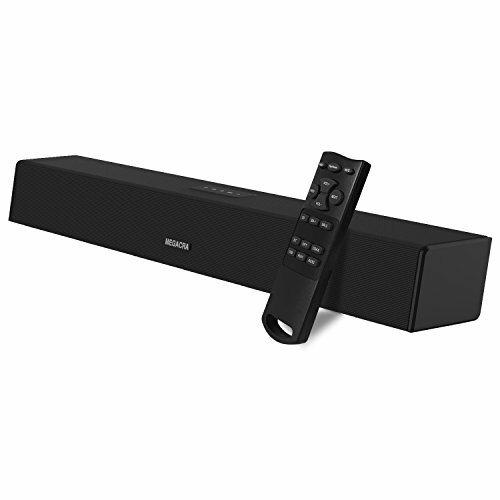 The VIZIO SB2820n-E0 Soundbar Home Speaker and the AmazonBasics 2.1 Channel Bluetooth Sound Bar with Built-In Subwoofer are a great example of soundbars under 100 bucks that still offer you fantastic sound and high quality all for a very reasonable price. Bookshelf or floorstanding speakers is better for a small medium room?